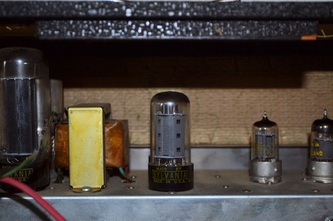 The second 7591 power tube is behind the first. 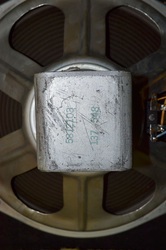 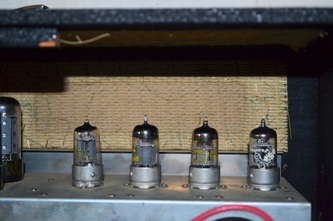 Behind the rectifier tube is the filter capacitor can. Chassis wiring and circuit layout. 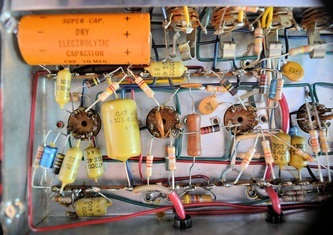 Note the addition of a bias pot, a feature not found on earlier and less sophisticated Hilgen circuits. 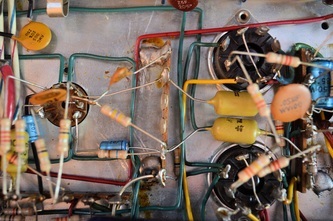 Creative use of multiple terminal strips to facilitate point-to-point connections without crowding. The Model R2523 Champion was Hilgen's only piggy-back guitar amp besides the Model 5063 Swing Away. 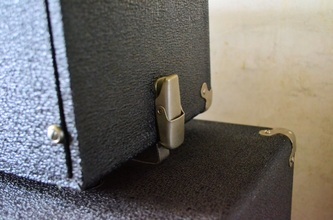 The head could be temporarily attached to the cabinet with snap latches. 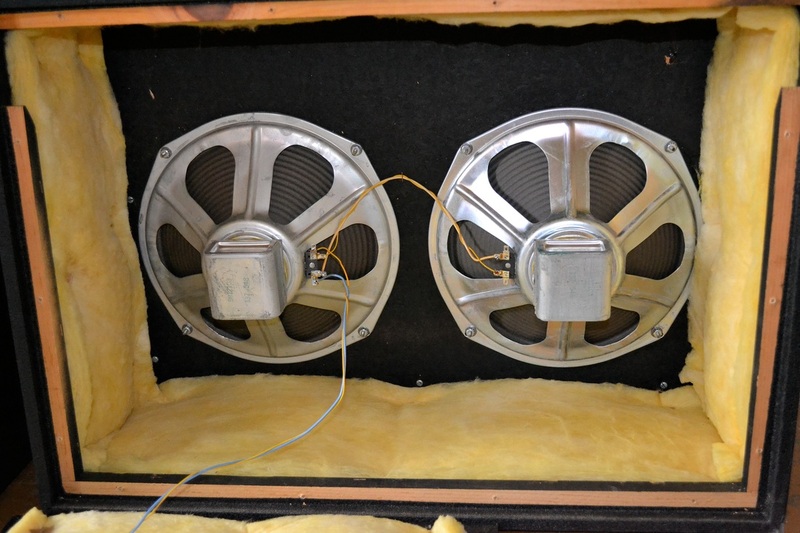 The cabinet was designed with a slanted front so as to direct sound from the speakers upward. The top of the cabinet slants downward from front to back, at a 90 degree angle to the speaker baffle, thereby rendering the control panel more easily accessible to the player. The cabinet top also has four rubberized recesses to receive the rubber feet on the bottom of the head, enhancing stability. 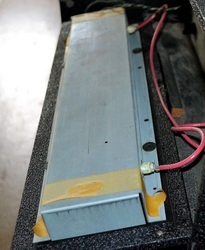 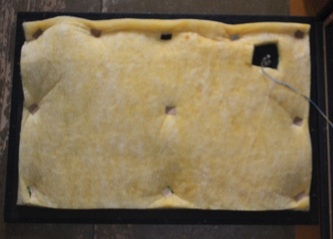 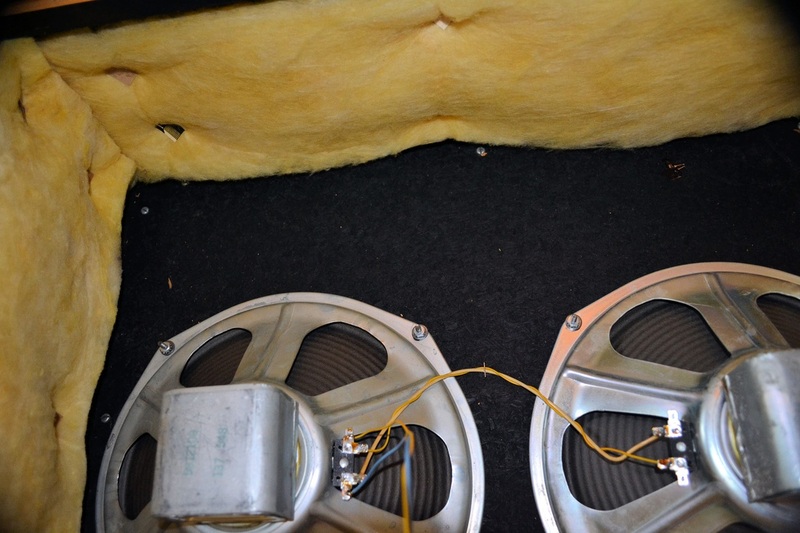 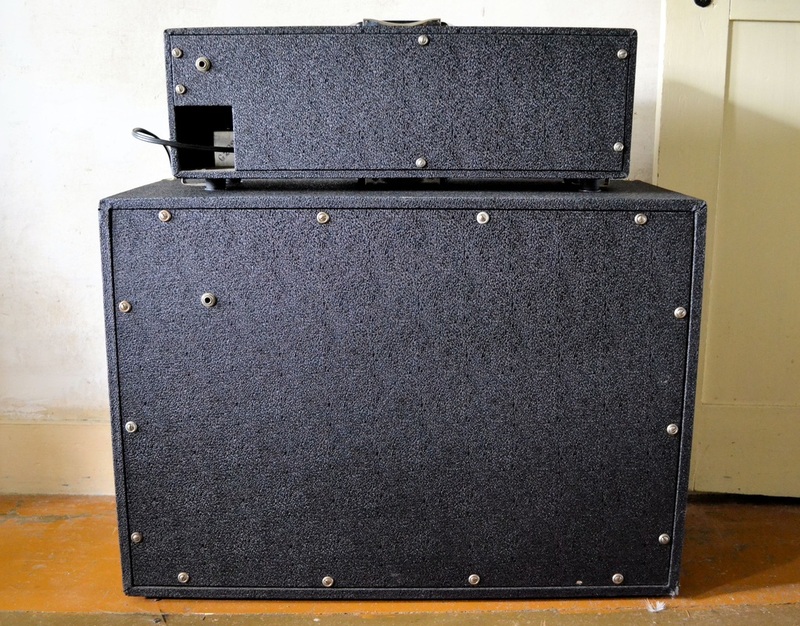 Attached to the rear panel of the head is a full-size Hammond/Gibbs reverb tank, connected to the chassis by standard RCA-type jacks. 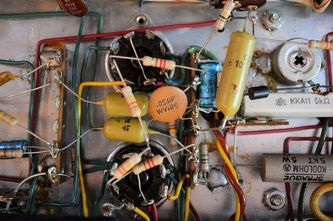 Although far simpler in design than the Model 5063 Swing Away Guitarist, the Model R2523 Champion is an exemplary lead guitar amp. 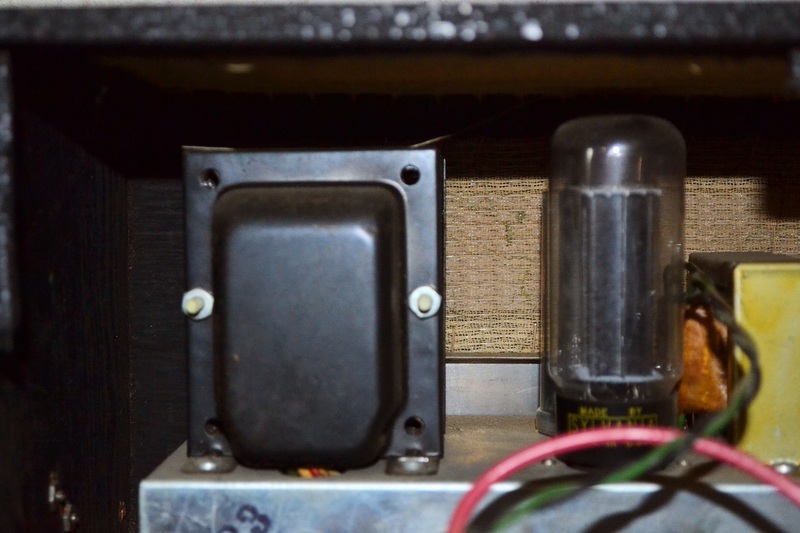 Because its power output is a little more than half that of the Model 5063 Swing Away Guitarist, the Model R2523 Champion breaks up at lower volumes. 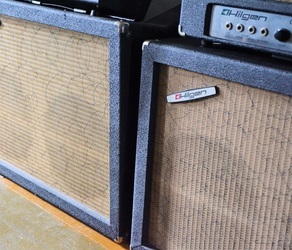 However, its distortion remains refined at all volumes, and is well-suited to producing a sweet, over-driven blues tone. 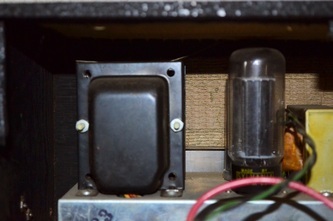 The single tone control is surprisingly versatile; one does not miss separate bass, midrange, or "presence" controls. 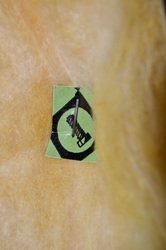 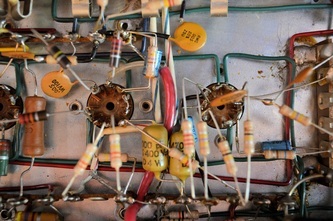 Although it has no depth control, the tremolo produces a fat, musical warble. 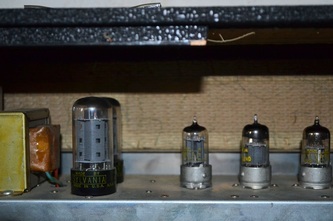 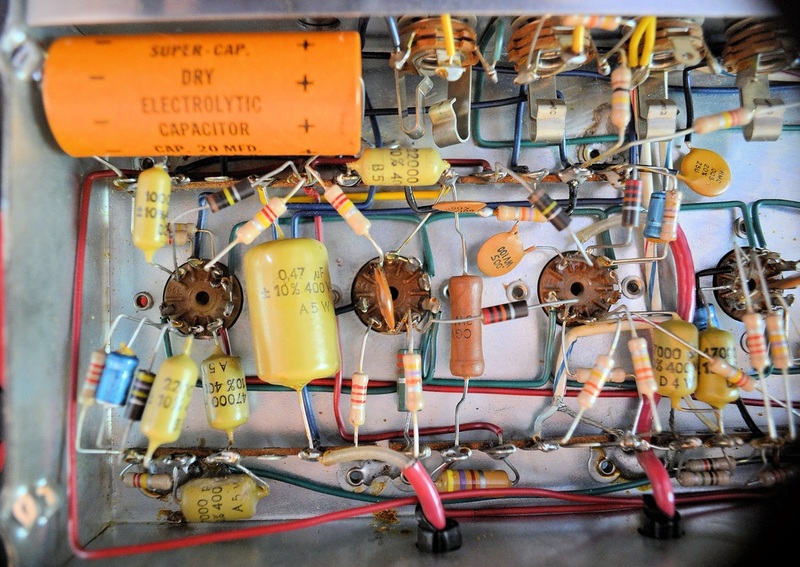 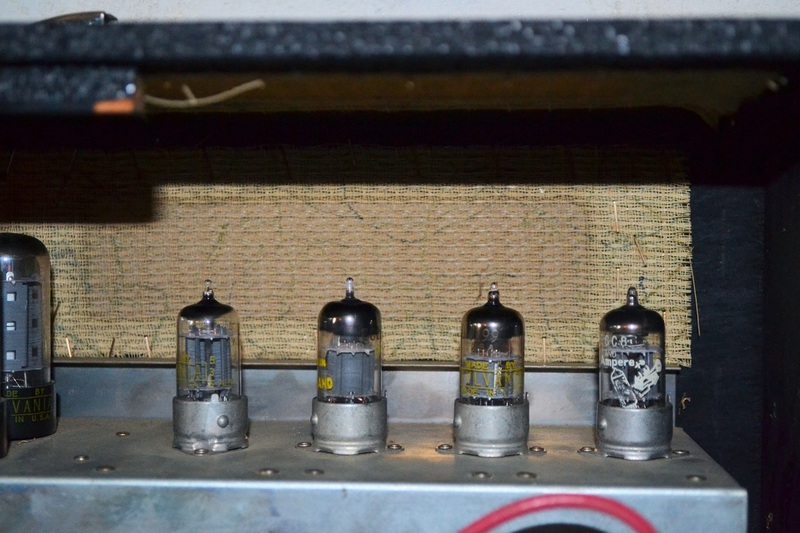 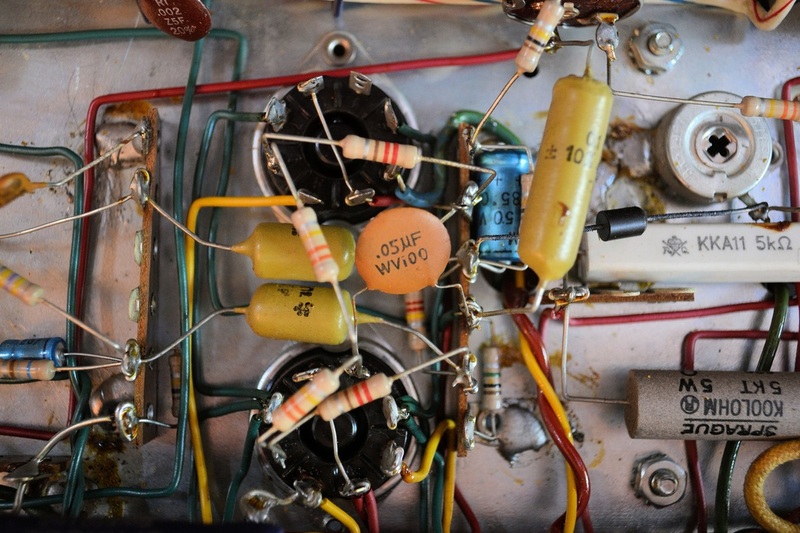 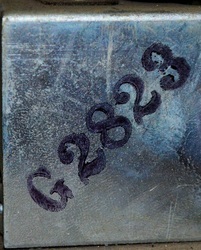 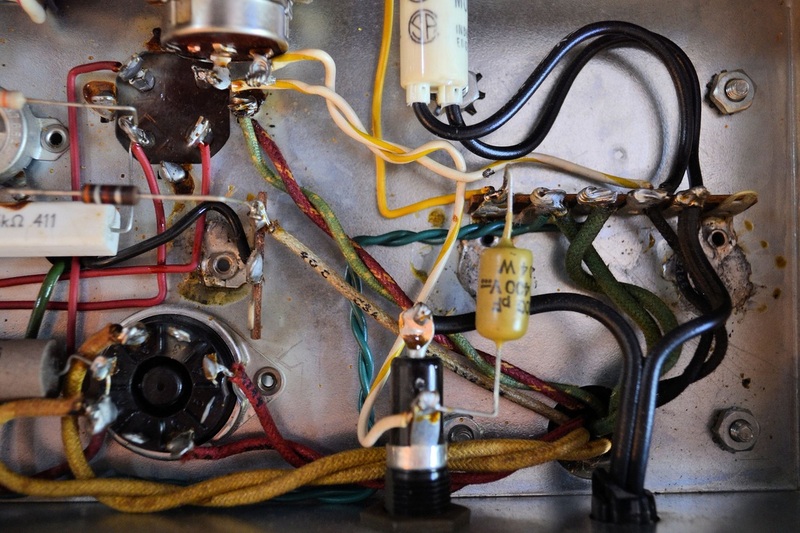 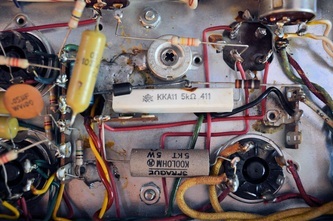 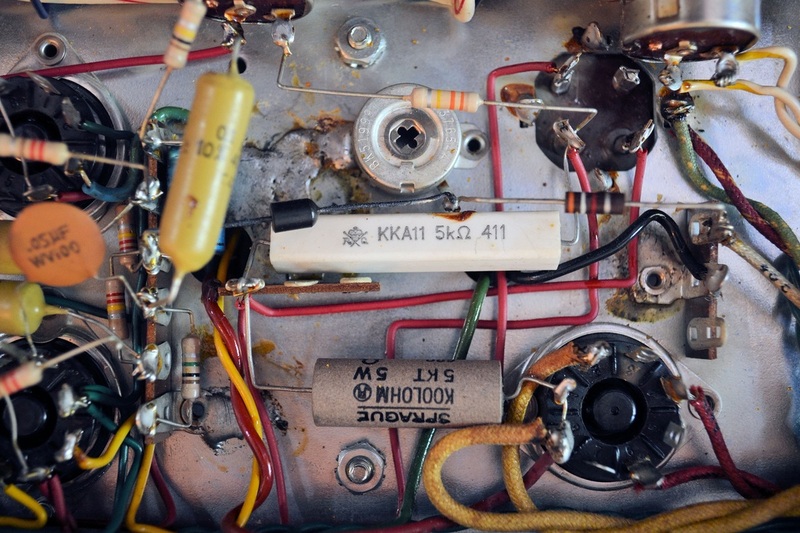 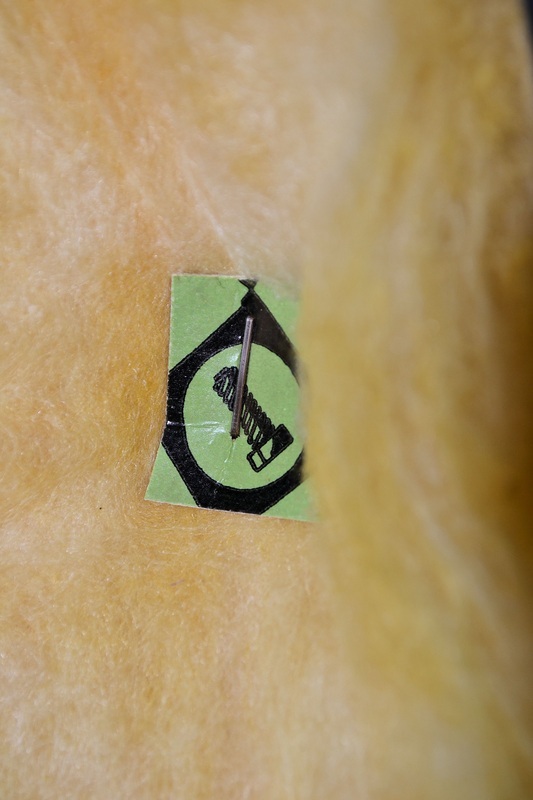 Date codes indicate that this amplifier was completed in 1966. 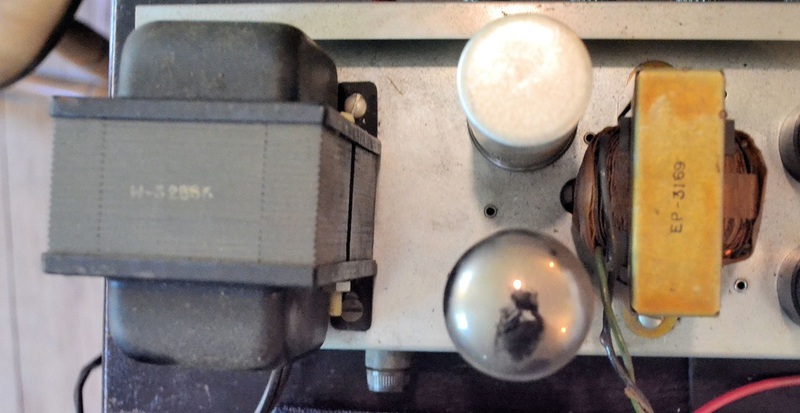 All tests performed on calibrated Hickok Model 535A tube tester.